We had a busy September regular meeting. There was an induction of a new member and many reports of our activities that are ongoing. 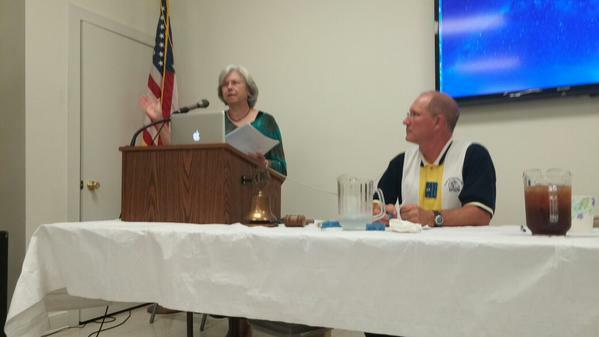 We also had an excellent program: Linda Balderson, a certified interpreter for the deaf, gave a talk on cued speech. When used in addition to sign language, cued speech can help improve literacy in children as it allows them to learn English phonetically and translate that language to our phonetic alphabet. Ms. Balderson told us about how, when she and her husband learned their daughter was deaf, they were able to learn how to perform cued speech in less than a week. Cued speech works by using hand gestures near the mouth and throat to represent the different sounds that can look similar when lips are being read. The hand gestures, instead of simple lip reading, make it much much more obvious what is being said. Ms. Balderson works as an interpreter in college and high school classrooms, cuing all the speech that is going on in the classroom to help the deaf students follow what’s happening.